Translation: We can’t get our fully enabled Prime Video app onto iOS devices or supported by Chromecast because we refuse to fork over the 30 percent cut of in-app purchases demanded by Apple and Google. Amazon will continue to sell Roku devices, as well as Microsoft’s Xbox and Sony’s PlayStation, where the Prime Video app is fully supported. The unspoken reason Amazon is banning Apple TV and Chromecast but not Roku and the others, of course, is that Apple and Google have their own content and advertising ecosystems built around their devices, just as Amazon is trying to build with Fire TV, Prime and Twitch, while Roku is simply a streaming platform without its own content ambitions (so far at least). Cutting off sales of Apple TV and Chromecast has less to do with the devices themselves as with their respective ecosystems. The move comes just as Apple and Google are each rolling out new generations of their devices aimed at expanding those ecosystems. The new Apple TV will become a full-fledged development platform with its own app store and SDK, while the new generation Chromecast features improved search and discovery and adds an audio-only version of the dongle that plugs into living room speakers, including non-Bluetooth enabled speakers — for playing streamed music directly from a smartphone or tablet. I suspect an even deeper fear for Amazon, however, has to do with the roll that mobility plays in both Apple’s and Google’s strategy for the living room. As I noted in a previous post, the new Apple TV is essentially an iPhone for the TV. It runs a full iOS core on the same silicon as in the latest iPhones, and the new app store and SDK will allow developers to create fully integrated mobile and set-top experiences to a degree not possible up to now while allowing Apple to leverage the creativity of millions of developers already familiar with creating rich experiences in iOS. It turns the living-room TV into an extension of Apple’s hugely popular and well developed mobile ecosystem. Chromecast, meanwhile, is simply a hub for turning any device, including otherwise dumb devices, into an extension of the Android mobile ecosystem. Given that 44 percent of all online video plays now take place on mobile devices, according to Ooyala’s Q2 Global Video Index Report, a figure it expects to surpass 50 percent by the end of this year, integrating mobile and set-top video will increasingly be crucial to content creators and advertisers. While Amazon’s Fire devices can “cast” content from the web to the TV Amazon does not own a dominant mobile operating system, its attempt to sell its own line of smartphones was a flop and it cannot boast an army of developers committed to the cause. The last thing Amazon wants to see is for the living room to become just another outpost of the iOS and Android mobile empires, which is exactly what Apple and Google are trying to do. Chromecast and Apple TV are the Trojan Horses of that empire building. Amazon can’t afford to let them through the gates. 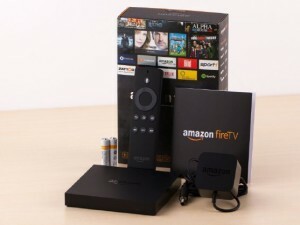 What's behind Amazon’s baffling decision to ban Apple TV and Chromecast?